Zimbabwe's government plans to compensate white farmers whose land was seized during the country's land reform in the early 2000s. But farmers say the $53 million in compensation is not enough and that land should also be returned to them. Zimbabwe’s government has started the process of compensating white commercial farmers displaced from their properties during the country’s land reform in the early 2000s. But farmers say the $53 million set aside for the purpose will not go far. Zimbabwe’s Commercial Farmers’ Union says it is waiting for details from the government on how it will compensate those whose property was seized during the country’s land reform program beginning in 2000. Union director Ben Gilpin welcomes the $53 million announced in the 2019 budget for the program, with some reservations. The program seized property from about 3,500 white commercial farmers and gave the land to blacks. Then-President Robert Mugabe said the reforms were needed to correct injustices of the colonial period. Zimbabwean Finance Minister Mthuli Ncube at State House in Harare, Zimbabwe, Sept. 10, 2018. He says the $53 million set aside for farmers is a stopgap measure. 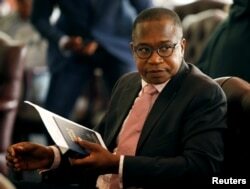 Zimbabwe Minister of Finance Mthuli Ncube says the $53 million is a stopgap measure while a figure is reached on how much is owed to all evicted farmers. “Zimbabwe is constitutional in its approach, government is following that constitution, which is we agreed to compensate the farmers in order to recognize the improvements and investments they had made on that land and we think that is just, that is fair, and that is what we will be doing going forward,” he said. Some farmers like Ben Freeth would like to return to their former lands. Freeth’s family was forcefully removed from their Mt. Carmel farm about 120 kilometers southwest of Harare by the government in 2008. The farm has been reduced to a nearly wild forest. But Freeth said that could change. Peter Knife, a herdsman for one of the people that was allocated the Mount Carmel farm land, says he wants commercial farmers to return. Whether the return of white farmers to the land is acceptable to Zimbabwe’s current president, Emmerson Mnangagwa, remains to be seen.